Yes! It's finished. My dress from the summer 1965 issue of Frohne. 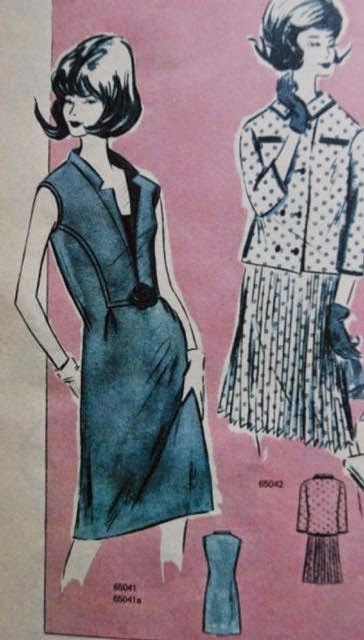 I haven't decided yet whether to call this my second or third item for the Vintage Pattern Sewing Pledge... I guess I'll let you know at the end of the month. My sewing machine is back in working order. The good folks of Mulder Naaimachines fixed it while I was there yesterday (there are good reasons why I always recommend them and obviously, none of those have to do with compensation, they don't even know I blog...). So, I could finish that last bit of stitching. As you may remember, I used the Frohne pattern enlarging system to make this design. I made a muslin first. That showed me I had to lower the bust darts by two centimeters (which means that when using Frohne, I have to add all the extra length above the bust... interesting) and the front shoulder was about 1.5 cm too wide. Otherwise the fit seemed fine but I decided to add back darts because I didn't like the sack shape there. I made the dress with those changes. I used a peculiar fabric from which I have quite a bit in my stash: really heavy linen in a black and grey herringbone weave. Not the greatest material for winter but then, this is not the greatest dress for winter, so I don't mind. Today was the lightest and brightest day in a week but still it was pretty drizzly and gloomy. We took these pictures at 2 p.m. and there were only a few without blurriness. At least E could help me because he was still at home (so rare for him to take sick leave, or need it). We tried to have a bit of 1960's style fun with the styling and posing but I fear it's all very fake. I tried a large size hair donut to imitate a beehive and only kept it because E thought it worked. He suggested using the kitchen as a decor, and then I insisted on me having a drink in that case (no alcohol was actually consumed during the taking of these pictures. It's soda in the glass). It's not a retro kitchen so really, it's a bit silly. The yellow tights are not wrong though. 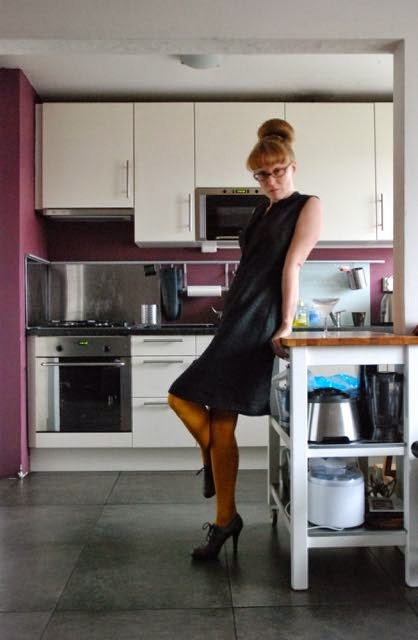 There was a craze for brightly coloured hosiery in the early 1960's. I know this from a magazine article from 1962 discussing the trend (and coming to the rather tame conclusion that it's OK to wear things like that if you have pretty legs, are young enough and it suits you...). Frohne patterns don't come with instructions of any kind. 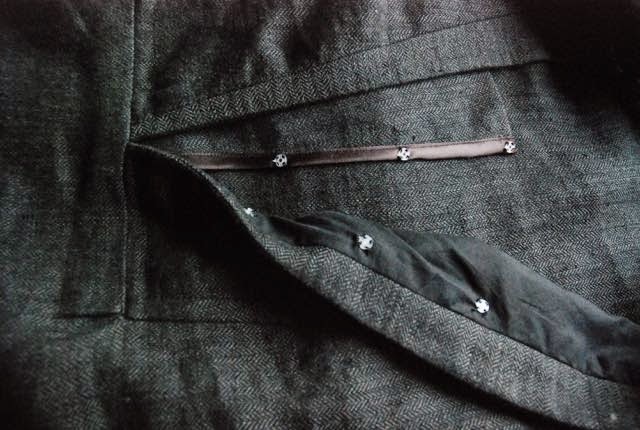 I'm very much used to sewing without instructions but that is usually with my own patterns. In which case I've been thinking about construction since before I put a pencil on the paper. In this case, the muslin helped me think about how to sew those little pleats at the corners of the front yoke in such a way that the seams could be finished. And I could test whether or not I needed a zipper. I didn't, even with the back darts. I attached the center front panel using sew-in snaps. This makes it easier to get in and out of the dress and it gives me an option which was really popular in the 1950's (not sure about the 60's, clothes were getting a bit cheaper then): using panels in different fabrics. I ran out of snaps, so I haven't made any yet, but I will. And the look... Another new silhouette for me and I like this one as well. This is kind of a transitional 1960's silhouette. No more figure hugging hyper feminine looks but no waistless mini either... It actually looks kind of modern. I've never hear of Frohne before, but really like this dress. I'm sure you'll get a lot of wear out of it. What a great look! Love the styling! Oh, I love this! It's very chic and looks really comfy and easy to wear too. your stitching is, as always, impeccable...that front panel! i think you succeeded with that fauxhive. now if only it weren't a fauxdrink ;)!